Geological Hazards: How safe is Britain? The Engineering Group (EGGS) and the South East Regional Group (SERG) of the Geological Society had a joint evening meeting on 14 October 2014. However, a technological hitch almost prevented Martin Culshaw giving his lecture entitled ‘Geological Hazards: How safe is Britain?’. Not one to be defeated by such matters, the SERG Chairman Simon Holt, saved the day with his resourcefulness and sourced the group an alternative venue. After a shuffle around of chairs, the 40 attendees squeezed into the rather cosy room and Martin’s whistle stop tour of geohazards that the UK is susceptible to ensued. Waste materials being placed upon or within the ground. Martin rounded up his lecture through questioning the reliability of using probability as a means of assessing hazard and risk. As probability assumes steady state conditions (which are not apparent within the natural environment), it is therefore difficult, all be it impossible, to predict the frequency of geohazards. Despite this, through his extensive experience, Martin has observed that we have a better chance of understanding the processes which occur as a result of the geohazards. Martin’s powerfully worded closing statement enforced the need to fully understand the geological processes through data collection in order to determine the relative susceptibility to a particular hazard and combine this information to determine the likelihood of the occurrence of future events. The EGGS evening talk on 9 July 2014 was almost cancelled when the speaker, David Shilston, was taken ill travelling to the Geological Society. While being treated by paramedics, David contacted Dr. Andrew Hart to step into the breach! As luck would have it, Andrew was more than qualified to ‘rock up’ and save the day. The lecture was entitled “LUSI: the origin, evolution and future of a mud volcano disaster in Java”, and took its 25 attendees (further joined us online) through the controversial origins of LUSI through to the situation today. It highlighted the mammoth engineering effort to contain the mud volcano, and the devastation the disaster has had on the local population. Andrew demonstrated how LUSI compares to other mud volcanoes around the world, including our very own Royal Wootton Basset mud springs! Andrew showed the audience Atkins’ work which analyses DifSAR data to show how the region around LUSI has subsided. This analysis was complicated by the presence of neighbouring gas fields which confuse LUSI’s deformation signature. LUSI continues to erupt, and Andrew questioned what the future holds for the evolution of LUSI – could it end up deforming a large area like its extinct neighbour, the 4km wide Porong Feature? How would this affect the lives of those who live and work nearby and the infrastructure within the area? 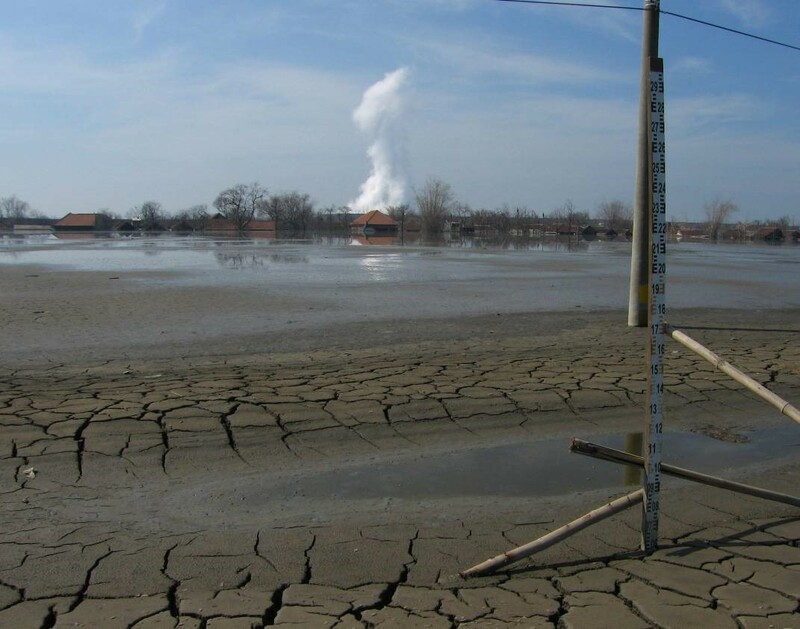 What about the long term stability of the earth embankments currently retaining the erupted mud? LUSI is a unique controversial event. 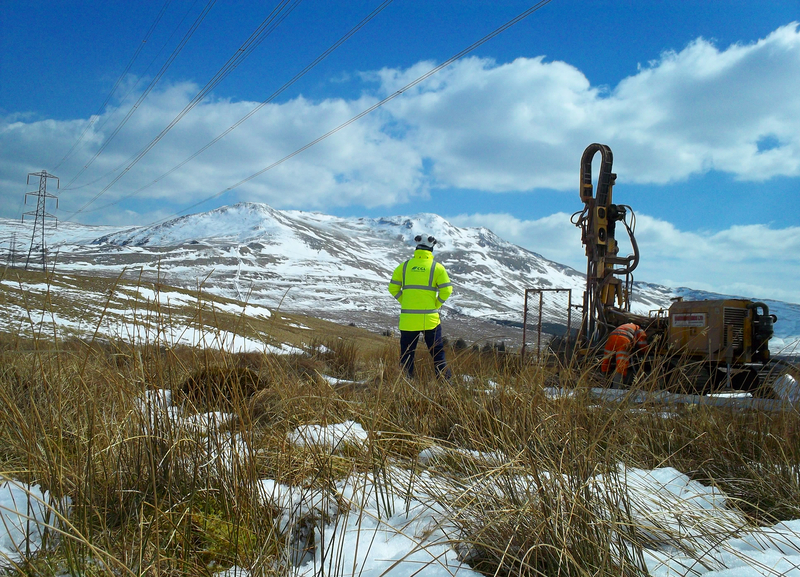 It highlights how important it is for us, as geologists and geotechnical engineers, to really understand the ground conditions and the risks associated with them. This year’s fieldtrip marked a departure from past excursions: a new convener, a new leader, and a new country. The trip started for some with pre-dinner swim at the Cairndale Hotel and Leisure Club in Dumfries. Following a sumptuous four-course meal, we gathered together for an introductory lecture from Alan. 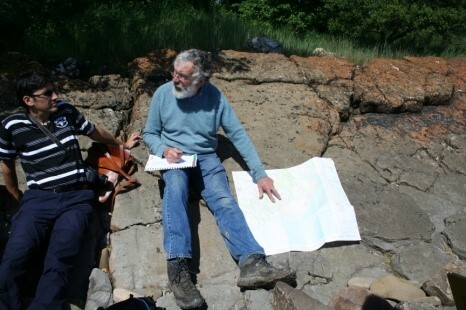 In a twist on the classic dictum, Alan’s talk “The Past is the Key to the Present” led us through the history of the Solway Firth and its wider context, using little more than a geological map to show us how events in the Carboniferous continue to shape the modern landscape and geology. Standing on the shore of the Solway Firth the following morning, with the hills of the Lake District rising through the haze, it was easy to imagine standing in the same place 400 million years earlier gazing across the closing Iapetus Ocean. We had started out at the eastern end of Gillfoot Bay and Alan challenged us to a simple task: “follow a layer of the rock until your feet get wet”. We duly did so and those paying attention avoided wet feet by following the layer around a tight angular fold. “How did that get here?” came the question, and so began a day of challenging geometry and enlightening insights. 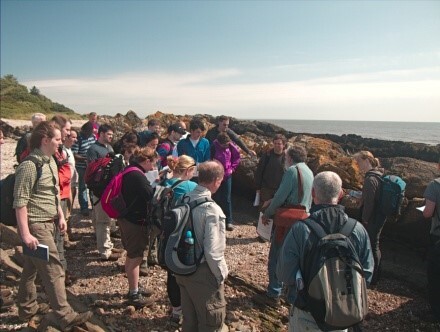 Showing how the rapidly changing nature of the rocks – from limestones to sandstones and even coals – directly reflected the modern environments – estuarine channels and sandbanks, to onshore mudflats – Alan began to elucidate the meaning of “the past is the key to the present”, interspersing geological truths with tales of pirates and witches. 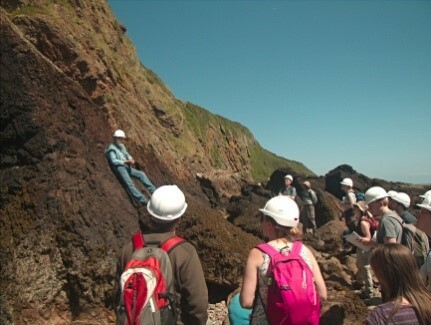 Following the coast, we were shown how fluid escape features in the rocks indicated the original vertical, as well as a range of slump structures and fossil organisms. We drove on to Rockcliffe, observing the path of an esker en route, and hiking south for lunch on the cliff top at the edge of Auchencairn bay. 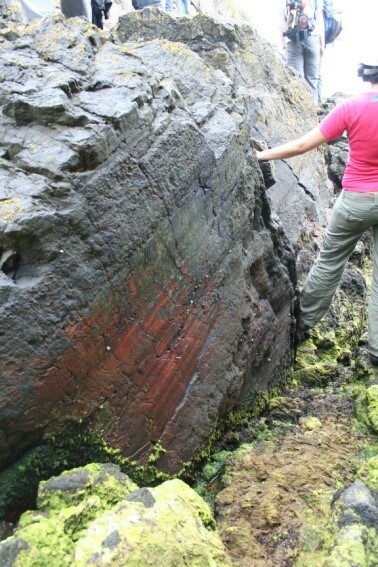 We then descended to the shore to observe one of the principle basin-bounding faults, the North Solway fault. The first point of interest is that the cliff itself is the exhumed fault zone: the past is again the key to the present. 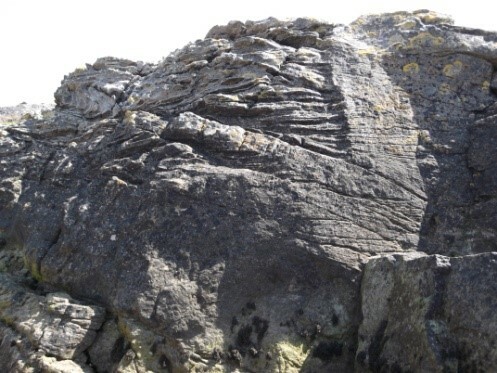 The second point is that the fault is not a simple linear surface; in places it has been exploited by porphyry dykes and it is offset at intervals, the nature of which would become apparent later. Where exposed, the fault surface displays a range of puzzling features. Conglomerate containing locally derived angular and rounded cobbles infilling cracks in the porphyry and Silurian country rock, indicating that the modern ground surface closely parallels the Carboniferous ground surface, an inference confirmed by the nature and dip of the basin-fill sediments adjacent to the fault scarp. These again consist of angular conglomerates dipping steeply seaward, with minor syn-sedimentary faults, dewatering structures, and repeated marine transgressions typical of active normal faulting. A further hike east past Gutcher’s Isle, where Gutcher attempted to leap across to the stack to impress a farmer’s daughter, with fatal consequences, led us to one of the most geologically spectacular sights of the trip. 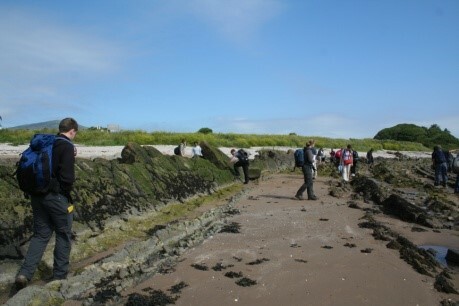 Here, the porphyry dyke traces a relay ramp between two sections of the North Solway Fault, sandwiching a section of Silurian sediments on the ramp. The path of the dyke beautifully illustrates how an apparently simple regional structure can result in local complexity; it was not hard to imagine the difficulties that would result from encountering such a change in a series of boreholes on site. The Sunday morning once again started with a long coach journey west, to the far side of Auchencairn bay, along a spectacular cliff top path and down to a complex coastal section. Once again, the cliffs bound both the ancient and modern basins and a view along them, and hence along the basin margin, reveals the several offsets similar to those at Gutcher’s Isle, itself visible across Auchencairn bay. Traversing along the shoreline, footwall conglomerates are evident, interbedded with finer-grained marine sediments, again indicating the discontinuous nature of fault slip. The fault zone is brecciated as at Rockcliffe but here there are kinematic indicators for oblique slip. A steep scramble up the cliff led to lunch, and a return to study the interbedded sediments. The engineering implications of their variability, particularly in relation to water flow, is only too apparent. The day ended with a visit to a former copper mine, its 40 m shaft covered only by a boulder. 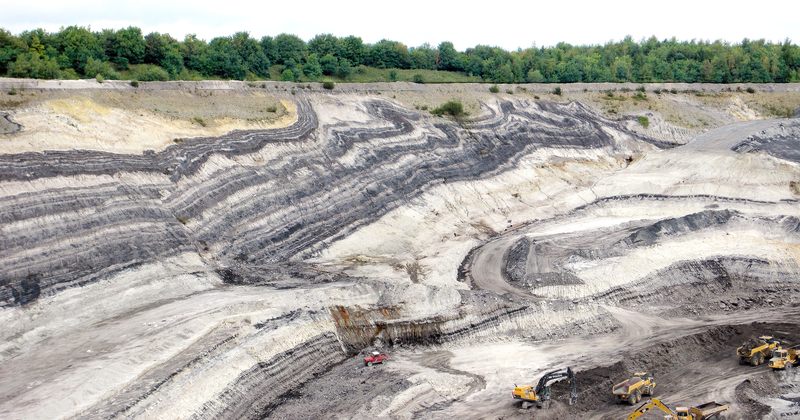 Mineralisation is common in these tectonic environments and was economically important in the area throughout Britain’s industrial heyday and may soon be so again, given the continued rise in demand for copper, gold and other metals. We returned to Dumfries in time to see Murray victorious at Wimbledon and celebrated a challenging, insightful and thoroughly enjoyable trip. The EGGS AGM and the evening talk by Dr. Mark Lee on 10 July 2013 were attended by approximately 45 colleagues ranging from Geological Society, ICE and IMMM members. Mark spoke to the group on “Managing Landslide Risks on Major Onshore Oil and Gas Pipeline Systems”, a subject he is particularly familiar with as a world leading expert! Mark explained why and where input from ground engineers is valuable for the early stages of routing an onshore pipeline. He showed examples of where this was achieved through remediation or avoidance of landslides. He also showed some other examples where landslides were not properly mitigated, which led to environmental, cost and public relations damage. The risks far outweigh any of the time spent on ground engineering input. An interesting observation to be taken away from the evening was that we, as ground engineers, understand our value early in a pipeline routing project, but pipeline engineers are less familiar. We are getting more recognised within this industry, but how can we bring our expertise into the guidance that pipeline engineers actually read? In May 2013 we launched the first EGGS photographic competition. We invited entries that represent interesting situations, features, construction methods or techniques through the broad sphere of Engineering Geology. The poll will be closed on the 19th July. The winner will receive a free place at a future EGGS one day seminar of their choice and a Special Edition EGGS mug. The two runners-up will receive Special Edition EGGS mugs. 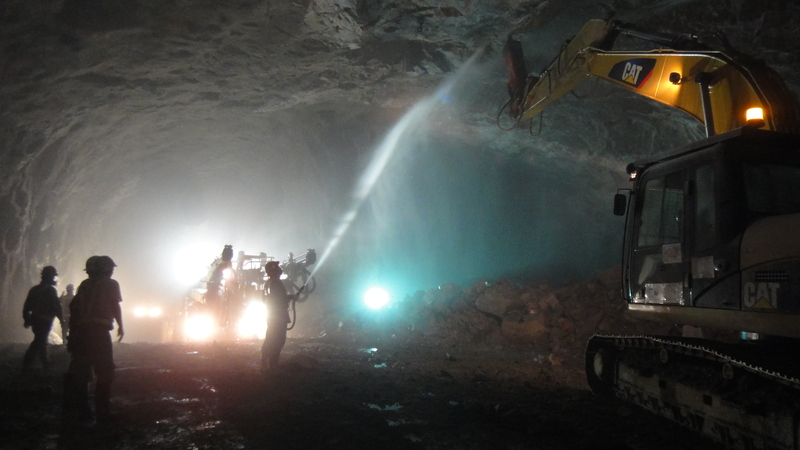 This short piece is to celebrate David Giles’ 17 year association with the Engineering Group of the Geological Society and his drive to educate, train and inform engineering geologists in the UK and overseas. 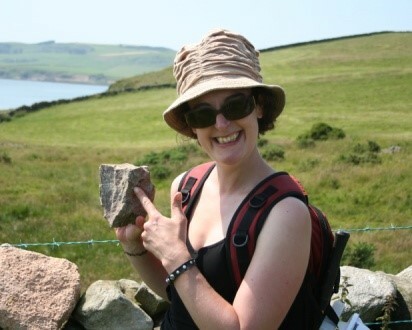 David, currently Principal Lecturer, School of Earth Sciences, University of Portsmouth, was voted onto the committee in 1995 and has been a very active member ever since. I think David is best known for convening the Groups’ excellent field meetings since 1997. For those who do not know, convening includes finding a suitable place for the meeting, experts who are informative and entertaining, good, inexpensive hotels that accept thirty or more engineering geologists, suitable transport, publicity, ensuring the meeting notes are complete for the delegates and all the finances to ensure a successful meeting. 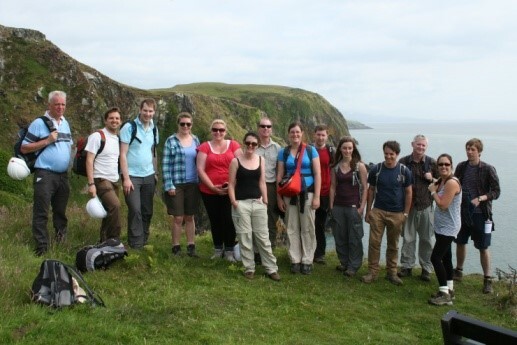 All who have been on any of the field meetings will attest that they are good fun and great for meeting other engineering geologists in a relaxed atmosphere. But, most of all, they are learning opportunities for all ages and all experiences to see engineering geology in context, which is in the field and to discuss engineering geology. As Herbert Harold Read, who was a professor at Imperial College, president of the Geological Society and a Fellow of the Royal Society said, “The best geologist is the one who has seen most rocks”. As you can see from the list of meetings they are varied and not only include England and Wales but a couple of trips to France. The meetings are organized without fuss, which is great news for those on the committee and the participants. Running like clockwork comes to mind.